The 2017 Allied Air Forces Memorial Day on September 3rd was as busy as ever. Each year, representatives from air forces across the world join us, together with other significant representatives, to commemorate the sacrifice of those serving in global airborne conflict and peacekeeping duties, both past and present. And each year, this special day grows in size and stature. 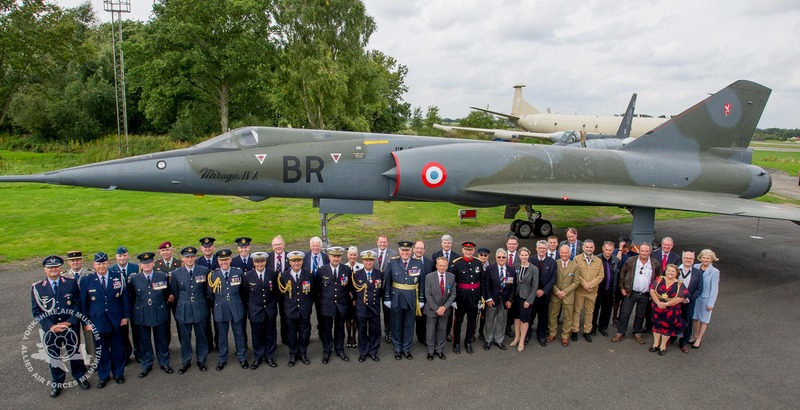 Of course, Sunday was of particular significance as it marked the final chapter in the remarkable story of the journey of the Dassault Mirage IVA Bravo Romeo to Elvington. You can read more about the decade long project to display this Cold War nuclear jet at the Museum here. Sunday saw the aircraft’s official roll out ceremony and a short dedication service to finally present the aircraft officially to the Museum. Visitors to the Museum are sometimes unaware of the unique relationship enjoyed by the Museum, the French Air Force and the people of France or indeed the reason for the presence of this majestic aircraft in the grounds of the Museum. In a short period towards the end of World War Two, the two French Air Force squadrons based here at Elvington suffered almost 50% losses as they flew Halifax bombers on raids over occupied Europe to help free their countrymen. Allied Air Forces Memorial Day 2017 from Yorkshire Air Museum on Vimeo. As guests arrived in the grounds of the Museum they were greeted with the sight and sound of our vintage biplanes, engines running on the grass in the Sunday sunshine as the SE5a and Eastchurch Kitten both ran their engines to the appreciation of many of our Air Force visitors from a modern generation of military flying. The Museum’s SE5a running live. The Dassault Mirage IV was enjoying the limelight, as joining us from the French Air Force was General Lesellier who, together with Museum director Ian Reed thanked the many, many people who had helped with expertise and contributed financially to this long project, many of whom were able to be with us to witness the Mirage, immaculately assembled and complete with a French Tricolour on her nose, ready for the short dedication ceremony. Following a short lunch break, the main memorial ceremony took place inside the main hangar. For the third year running, we have had the three major National Standards Paraded and formed up on the Drum Head: Royal Air Forces Association; Royal British Legion and Royal Observer Corps Association. Plus of course the 72 Squadron (RAF Linton on Ouse) and Souvenir Français, making up the Senior Standards. Combined with some soulful and stirring music from the Yorkshire Military Band & Thirsk Royal British Legion Band Corps of Drums, the ceremony was greatly appreciated by both guests and museum visitors alike. Previous years have seen the award of Légion d’Honneur medals to WW2 veterans. This year saw the award given to Mr Robert McClements for his service in the Royal Air Force, a truly mazing record of flying no less than 39 missions over occupied Europe. Veterans from 299 Parachute Association were also with us. The ages of these airborne veterans spanned the entire history of airborne soldiering, with several Arnhem veterans joining others from more recent conflicts. When given the option to join the parade and march together, they didn’t need to be asked a second time. Red berets were checked for perfect alignment and backs were ramrod straight as these remarkable men marched together. Following the ceremony, the Parade was re-formed for the traditional March-past for the ‘Sunset Ceremony’, which saw the Dipping of Standards and Lowering of the Ensign by Air Training Corps Cadets, accompanied by the Evening Hymn played by the Band and Corps of Drums before the final salute and march off. Afterwards, Museum Director Ian Reed commented, “This has become one of Britain’s most significant air memorial events of its kind and we are delighted that more countries recognise AAFMDay and more people attend from across the World every year. Thank you to everyone who particpated and made this year such a great success. See you all in 2018 – where we will be commemorationg the Centenary of the end of WWI and the birth of the RAF”. Yes, it seems to have been a marvellous day, and the operator of the movie is simply great. The present and the past allies, and a little boy to figure the future. Everything was perfet and the weather too, maybe unexpected ! Rule Brittania and vive la France. A ’45 pilot’s son, aged 86 now ! Remember forever. As usual a magnificent, memorable video record of the great event. I did not personally attend, but on behalf of my colleagues at the Huddersfield branch who were able to participate, I thank you for your efforts on the day. I will definitely make it next year!